Fred Magdoff is Professor Emeritus of plant and soil science at the University of Vermont and author of many articles including “A rational agriculture is incompatible with capitalism” (Monthly Review, March 2015) and “An ecologically sound and socially just economy” (Monthly Review, September 2014), and of books including The Great Financial Crisis (with John Bellamy Foster, editor, Monthly Review) and Agriculture and Food in Crisis (edited with Brian Tokar) (both from Monthly Review Press). A frequent Monthly Review contributor, Magdoff is closely associated with struggles of the working people. 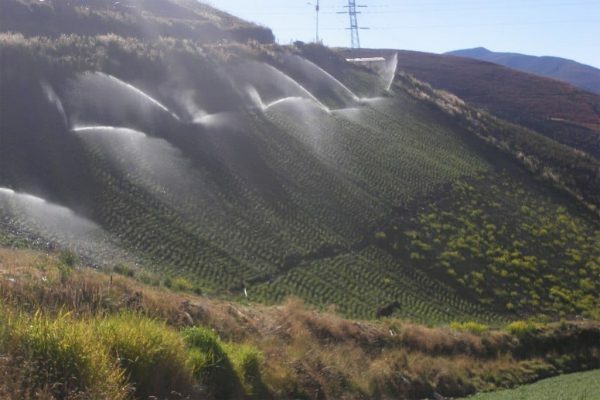 In this interview conducted in March 2019 by Farooque Chowdhury, Magdoff discusses the problems produced by capitalist agriculture in rural Venezuela. Farooque Chowdhury: The Venezuelan people’s struggle to transform their society is evident throughout the society. In the rural areas, the struggle is occurring in a number of places, and on many different levels. 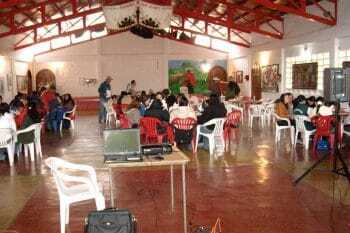 About a decade ago, in 2009 you worked with people in a rural part of Venezuela. What brought you to there in the first place? Fred Magdoff: I visited Venezuela twice, early in 2008 and then again in 2009. During the first visit, I was part of a U.S. delegation that traveled widely, and mainly in rural areas. We visited a cacao growers cooperative in which some members were also producing finished chocolate; a fishing coop, now that large fishing trawlers were banded from their waters, its members were able manage the fishing using a rational approach to catch quantity and size of fish; and a crop growing cooperative and corn processing facility. Later, I visited on my own an 83-member farming cooperative, talking with farmers about their farm and how they operate. In this visit, I was in Venezuela at the peak of the 2008 world food crisis during which prices of basic foodstuffs such corn (maize), wheat, rice, soy, palm oil rapidly increased in price, outpacing the ability of many people to purchase food. Riots broke out in Haiti, North African countries, and in South Asia. The Venezuelan people were protected from these brutalities of the market even though the country depended upon importing a large percent of the food. Every community had previously established places to provide one hearty meal a day to anyone needing assistance, with local people cooking in their homes and food provided without cost by the government. This was the period in which the country was setting up an innovative system of community councils in order to plan and carry out priority projects such as building a new school, a clinic, and bringing water to a village. Projects were decided on locally and the local population provided much of the labor, but the resources to make it happen came from the central government. The second visit was in early 2009, primarily to participate in a farmer meeting held in Mucuchies, a small town in the Venezuelan Andes. What kinds of things did you do with these farmers? Breakout discussion during farmer meeting. Photo credit: Fred Magdoff. Agroecologist and activist Miguel Angel Nuñez invited me to be a participant in the meeting, and to help plan together with farmers and others. In addition to a planning meeting (with a Cuban agronomist also attending), I visited a number of farms in order to see what issues they were having. 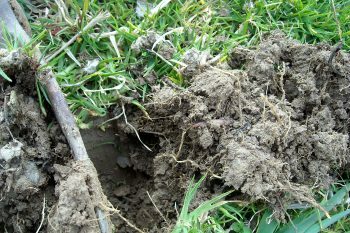 I took photographs and dug some soil to be able to speak in specifics about their problems rather than in generalities. What were the geographical characteristics of the area? 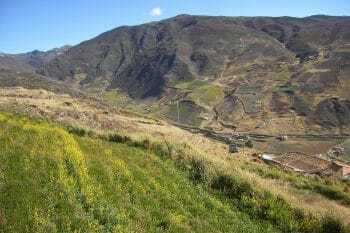 The town and its surroundings are about 3,000 meters above sea level and therefore quite cool. Farmers were concentrating on a few lucrative crops such as garlic and strawberries, growing them year after year. 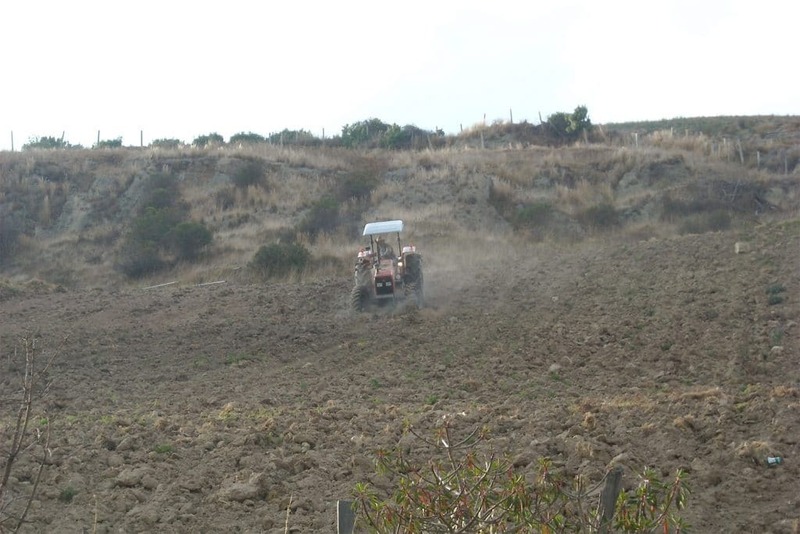 Much of the farmland was on sloping soils and erosion was a major problem. Large gullies had formed with little done to stop their advance. What were the economic, social and political characteristics in the area there? I really didn’t learn much about that. The farms were owned by individuals (this was not a cooperative), and farmland was very expensive, many times more per hectare than quality farmland in the United States. This was because of the climate, certain very lucrative crops could be grown that could produce a high return per hectare. The farms were not large, but clearly, those that owned them were making a good living at that time and had invested substantial capital. I would guess that the meeting was attended by around 100 people. They were mainly from farm families and people working with farmers. I didn’t get a good feel for this. A farm group was involved in planning and carrying out the workshop. Other participants in the planning included the Cuban agronomist I mentioned and a Venezuelan agroecologist. How did you organized your work? A few farmers raised cover crops and they had soils with better structure and biological activity. Photo credit: Fred Magdoff. As I mentioned earlier, I went to visit a number of farms to see and evaluate the soil issues. The soils, many on steep slopes, were also very prone to erosion because of depleted soil organic matter (which helps form stable soil aggregates) and the intensive use of tillage. In this condition, once the soils are plowed and harrowed, those surface soil aggregates that still exist are prone to disintegrating with the first rains (or irrigation). The soil surface then doesn’t accept water as readily and runoff becomes more of a problem. As water runs over soils it carries soil particles with it—soil erosion. I saw old stone terraces that help slow down water movement down the slope, many not kept up. There were no diversion ditches running across the slope to divert water to the side of fields. Nor were any cover crops growing to protect the soil surface and hold onto the soil. How did people participate in the initiative? Mostly the workshop consisted of talks and discussion among the group. It was a fairly typical format except that farmers had been important in planning and carrying out the workshop. What were the contradictions in the socio-economic matrix you observed there? The farmers understood that they had significant problems that needed addressing but with the cost of land so high, they felt that they were locked into growing these high-value crops. Although looking for alternatives, they felt constrained by the system that they found themselves in. Keep in mind that Venezuela was (and still is) a capitalist country in which the leadership and a good portion of the population wants to build a new socialist society, but to do so without first eliminating the old one. This has presented the country with numerous problems; many of those were playing out at that time and continue today (March 2019). They were building new ways to make decisions—the community councils, and then the communes and the modest land reform efforts and development of cooperatives; but the overwhelming portion of the economy was, and still is, in private hands. 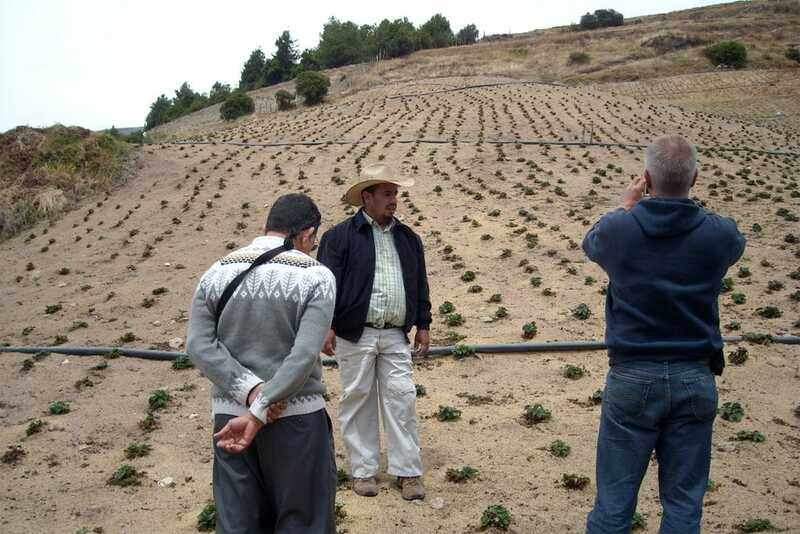 Thus, what these farmers faced is an example of the contradictions that can develop in this situation: the antagonism between what makes economic sense in a system with capitalist relations and what makes ecological sense. What were the primary problems encountered by the farmers? Farmers were locked into a system that did not lend itself to an ecological transformation. This does not mean that there wasn’t great room for improvement. But they had purchased land at great cost, and therefore felt that they had no alternative to growing the most lucrative crops. Given the cool climate, garlic and strawberries were two of these crops. And garlic was sometimes the only crop that was grown, making pest problems worse. Clearly, other crops could grow well under these climatic and soil conditions and better rotations were theoretically possible, but hard to justify in their situation. Plowing on steep land is difficult. 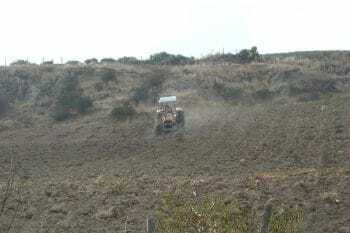 This person is plowing up and down the slope, making the soil more prone to erosion. Photo credit: Fred Magdoff. Sprinkler irrigation in steep field. Photo credit: Fred Magdoff. Fields on steep slopes. Photo credit: Fred Magdoff. Strawberry field fertilized with chicken manure. Photo credit: Fred Magdoff. How were the problems resolved? There were a number of practices discussed at the meeting to reduce erosion and to help create healthier soils by building up soil organic matter, keeping the soil protected by vegetation, and providing biological diversity. These included intensive use of cover crops (to keep the soil covered during the period when crops aren’t present), reducing the intensity of tillage, installing diversion ditches that run across the field along the contour, and exploring the addition of other crops to develop a real crop rotation. I did not return to Venezuela after the workshop, and so do not know if any of the possibilities were explored. What successes and/or failures did you identify? Any key lessons to be drawn? It was another example of the irrational social and ecological choices that are made in a system governed by the pursuit of profits. As I mentioned before, much of Venezuela was and is capitalist. The government of Chavez nationalized oil and a few other industries, did carry out some—but very incomplete—agrarian reform, and encouraged cooperative formation. Still, most of the economy remains in private hands and operates under the logic of capital. On the other hand, my visit to Las Lajitas cooperative and discussion with its members during my earlier visit demonstrated how people working together can produce well and live well while using ecological approaches to farming and progressive social policies such as rotation of leadership responsibilities. How do you, one close to Monthly Review, feel about joining the struggle in Venezuela while you actively carry on fight at ideological and theoretical level in association with Monthly Review? The struggle for a socially just and ecologically sound society is going to be a long one with activities needed on many fronts. This includes the crucial work of organizing and activist engagement as well as writing and giving talks to help others understand the economic, political, and ecological complexities that exist and why so many of the problems facing humanity are either caused or made worse by capitalism. But we also need to be thinking about how we can relate better to each other and to the rest of the natural world. This needs to happen as part of the struggle for a better world. I view practical work of helping farmers use an ecological approach to farming as part of the larger struggle. Not sufficient by itself, but an important component of the whole. Thank you for sharing your experience in a rural community in Venezuela. It was my pleasure to reflect on these activities from a decade ago. Farooque Chowdhury is a freelance writer based in Dhaka. His books in English include Micro Credit, Myth Manufactured (ed. ), The Age of Crisis, and The Great Financial Crisis, What Next? : Interviews with John Bellamy Foster (ed. ), Dhakha: Books (2012), 190 pp. Fred Magdoff is professor emeritus of plant and soil science at the University of Vermont and a long-time commentator on political-economic topics. He is coauthor, with John Bellamy Foster, of The Great Financial Crisis (2009) and What Every Environmentalist Needs to Know About Capitalism (2011)—both published by Monthly Review Press.